A splendid array of prayers in honor of the Blessed Trinity has developed to form the Ordinary of the Mass. One immediately sees how the Mass of the Catechumens is Trinitarian throughout; the Kyrie—petition to the Blessed Trinity; the Gloria—praise to the triune God; the Oration—directed to the three divine Persons by its conclusion. The three messages — Epistle, Gospel, Sermon — are linked very closely to the three divine Persons, while the Credo is a joyous acknowledgment of our faith in the Father, Son, and Holy Spirit. A special profession of faith in the Trinity is made today at Prime, the Athanasian Creed. 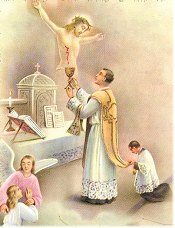 The finest prayer to the Blessed Trinity is holy Mass itself, for it is the supreme expression of praise, thanksgiving, and petition to the triune God. In the Gospel we meet the principal Scripture passage which mentions the three divine Persons. Christ gives His apostles the command: "Go . . . baptize in the Name of the Father and of the Son and of the Holy Spirit." Our own selves should be the gift dedicated to the Blessed Trinity at the Offertory. During the distribution of holy Communion the Church says to us: This Bread from heaven is a love-token from the triune God. Christ effected your salvation, the Father preordained your redemption by calling you, the Holy Spirit is infusing grace after grace to insure your perseverance.